In this study, I focused mainly on the radioactive decay of cadmium 109, which occurs at 463 days. My objective is to detect if a time delay occurs in the different AGNs. The following light curves of the AAVSO correspond to 1,000 days of observation. Below, I expose the list of all radioactive elements within this period. Although I show the three types of explosions, as I have defined it in my previous article (it is the first link of this Web), Type III Explosions are the most energetic. Therefore, they are the ones that best adjust to secondary explosions with the disintegration of radioactive elements, measured in their half-life. As their behavior are the least random, it is easier to find a pattern of behavior among them all. 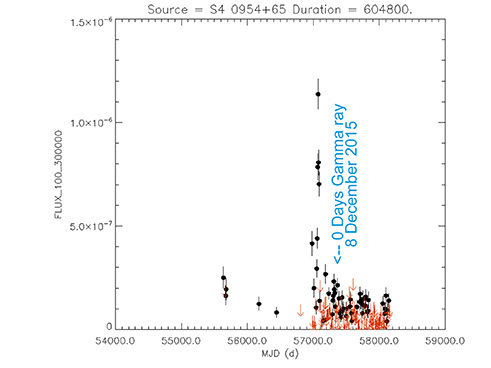 As seen in the following light curves of the AAVSO, in most of them there is a time delay in the AGNs studied. The maximum brightness in the optician is the point that I consider as the Main Explosion, marked as 0 days. It is also observed that the maximum brightness in Gamma rays usually occurs about 3 days before. 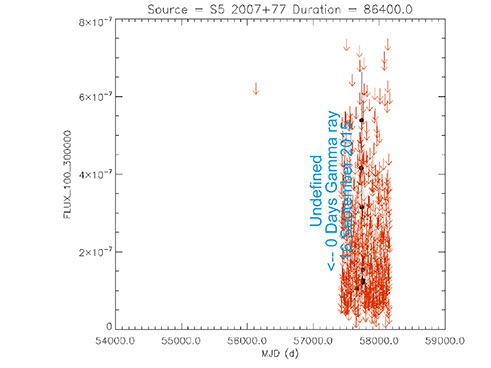 The time delay in all subclasses of AGNs (Blazars, Quasars, Seyfert 2 galaxies, etc.) is the same. The only thing that is appreciable in its curves of light, is its lower light amplitude. Secondary explosions are directly related to the radioactive decay of the different elements. What is more difficult for me is to detect the exact moment of the main explosion and secondary explosions. As I gather more light curves, I will attach it and reduce the errors. That is, I want to further define the light curve and its time delay. That is why, if the maximum brightness in the optical occurs a few days after the radioactive decay of Cadmium 109, which occurs at 463 days, then a time delay in the AGN is deduced. Actually, this is my main objective of this study. If so, all maximums (red lines) and minimums (blue lines) will be displaced to the right in their proportion (blue and yellow discontinuous lines). 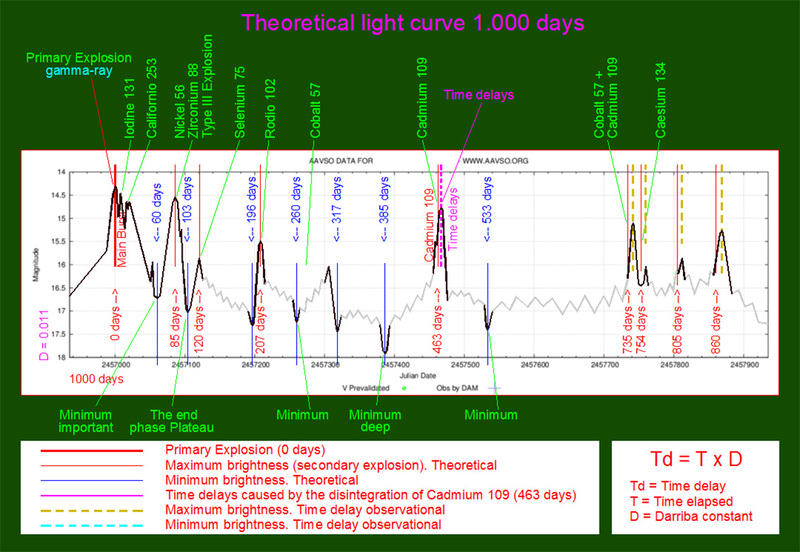 In the graph below, a light curve of an Explosion of Type III is theoretically represented, with a maximum brightness very marked in the 85 days, as bright as the main explosion. If the AGN were really a Type I Explosion, secondary explosions would not be detected in most cases. If it were an Explosion of Type II, the maximums in the secondary explosions would be more representative, but it would not have a maximum in the 85 days. The blue crosses correspond to my observations. - The Blazares are still predictable. Light curves 1,000 days. - There are three types of main explosions. Type I, Type II and Type III. - At the time of a principal explosion, a cascade of stable elements is produced as radioactive. - The radioactive decays of the different elements cause secondary explosions. - Depending on the sharpness of the secondary explosions, the width of the jet can be known. when there is a delay in the secondary explosions, it is a clear indication of their time delay. That is, each Blazar has its own time delay. - In Gamma rays, the main explosion usually happens about 3 to 10 days before the optic. or about 8 days later. Symmetry can also occur in a Gamma explosion separated by one or two weeks. In short, the temporal delay in gamma rays is equal to or greater than the optical. or about 8 days later. - A separate symmetric Gamma explosion may also occur for one or two weeks. - It is possible that the symmetry is produced by the precession of the two emitting Gamma lobes, when rotating. Hence, the Gamma flash occurs one week before or after its time delay. - In short, the time delay in Gamma rays is equal to or greater than the optical. Each Blazar has its own time delay, so I apply a constant (D). As can be seen, the time delay (Td) is proportional to the elapsed time (T). The radioactive decay of Cadmium 109 that occurs at 463 days (red line), the maximum increase in brightness occurs 12 days later (pink line), so there is a time delay in the emission of radiation in the Blazar. As it has been an Explosion of Type I, the great majority of the secondary explosions produced by the different radioactive elements are not observed or are not significant. This is a characteristic of this type of explosions. Mainly, only their brightness minima are defined. The absolute minimum brightness occurs at 385 days after the main explosion plus its delay time (discontinuous blue line), as it is very clearly observed. The explosion of Cadmium 109 is of such magnitude that another cascade of stable elements is created as radioactive, producing predominantly radioactive Cobalt 57 that decays in Iron 57 stable at 272 days after this explosion (red line at 735 days, 463+ 272 = 735 days), but since the Blazar has an appreciable time delay, it actually occurs 16 days later (discontinuous yellow line), verifying its time delay in direct proportion. It is even seen that 18 days later (the next discontinuous yellow line) the typical increase in brightness of a major explosion occurs. 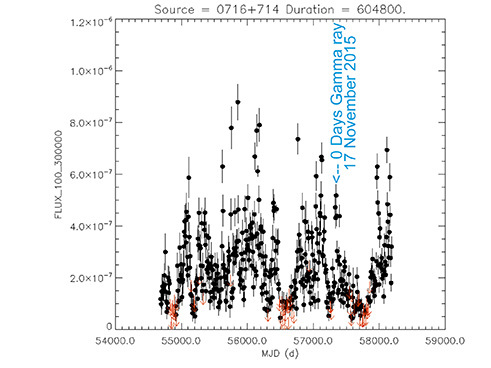 With respect to the second light curve, I have found another main explosion of Type I, It is noted that between 60 and 103 days there is no secondary explosion, confirming that they have been Type I. The absence of monitoring in this section of the curve, other secondary explosions are not appreciated. The difference between the two main explosions has been 4,025 days (11 years). In the AAVSO database, I can not conclude that there is a previous repetition due to lack of observations. If it were repeated in the future, the next major explosion would occur around July 25, 2023. The radioactive decay of Cadmium 109 that occurs at 463 days (red line), the maximum increase is not very defined in this type of explosion. The absolute minimum brightness occurs at 385 days after the main explosion plus its delay time (dashed blue line), as it is very clearly observed. The minimum is also very clearly observed at 260 days. The explosion of Cadmium 109 is of such magnitude that another cascade of stable elements is created as radioactive, producing predominantly radioactive Cobalt 57 that decays in Iron 57 stable at 272 days after this explosion (red line at 735 days, 463+ 272 = 735 days). As this object does not have a time delay, the maximum brightness occurred exactly at 735 days. The radioactive decay of Cadmium 109 that occurs at 463 days (red line), the maximum increase in brightness occurs 3 days later (pink line), so there is a time delay in the emission of radiation in the Blazar. As it has been an Explosion of Type II, an explosion occurs at 52 days, 75 days and 90 days. This is a characteristic of this type of explosions. There is not a big explosion at 85 days. The absolute minimum brightness occurs at 385 days after the main explosion plus its delay time (discontinuous blue line), as it is very clearly observed. Other important minimums are 260 days, 317 days and 533 days. The explosion of Cadmium 109 is of such magnitude that another cascade of stable elements is created as radioactive, producing predominantly radioactive Cobalt 57 that decays in Iron 57 stable at 272 days after this explosion (red line at 735 days, 463+ 272 = 735 days), but since the Blazar has an appreciable time delay, it actually occurs 6 days later (discontinuous yellow line), verifying its time delay in direct proportion. It is even seen that 18 days later (the next discontinuous yellow line) the typical increase in brightness of a major explosion occurs. With regard to the explosion in Gamma rays occurred 3 days before the maximum brightness of the main explosion in the optical (very common in the Blazars), so this difference tells us that these two explosions in different wavelengths are not produced exactly in the same place. The radioactive decay of Cadmium 109 that occurs at 463 days (red line), the maximum increase in brightness occurs 15 days later (pink line), so there is a time delay in the emission of radiation in the Blazar. The explosion of Cadmium 109 is of such magnitude that another cascade of stable elements is created as radioactive, producing mostly radioactive Cobalt 57 that decays in Iron 57 stable at 272 days after this explosion (red line at 735 days, 463+ 272 = 735 days), but since the Blazar has an appreciable time delay, the maximum brightness will be produced 22 days later. The radioactive decay of Cadmium 109 that occurs at 463 days (red line), the maximum increase in brightness occurs 6 days later (pink line), so there is a time delay in the emission of radiation in the Blazar. As it has been an Explosion of Type III, an explosion occurs at 85 days as intense as in the main explosion, but its brightness increase is gradual and almost symmetrical. This is the main characteristic of Type III explosions. The minimum is also clearly observed at 60 days and at 103 days, unmistakable in this type of explosions. The explosion of Cadmium 109 is of such magnitude that another cascade of stable elements is created as radioactive, producing mostly radioactive Cobalt 57 that decays in Iron 57 stable at 272 days after this explosion (red line at 735 days, 463+ 272 = 735 days), but since the Blazar has an appreciable time delay, it actually occurs 2 days later (discontinuous yellow line), verifying its time delay in direct proportion. It is even seen that 18 days later (the next discontinuous yellow line) the typical increase in brightness of a major explosion occurs. With regard to the explosion in Gamma rays occurred 4 days before the maximum brightness of the main explosion in the optical (very common in the Blazars), so this difference tells us that these two explosions in different wavelengths are not produced exactly in the same place. Even observing the two light curves in gamma rays it is observed that there are two explosions separated by 471 days, produced by the explosion of cadmium 109, confirming a time delay very similar to that in the optic. The radioactive decay of Cadmium 109 that occurs at 463 days (red line), the maximum increase in brightness occurs exactly on that day (pink line superimposed on red line), so there is no time delay in the emission of radiation in the Blazar. Even with observations remaining around 85 days after the main explosion, everything seems to indicate that it was an Explosion of Type III. The minimum is observed very clearly at 60 days and at 103 days, unmistakable in this type of explosions. The minimum absolute brightness occurs at 385 days after the main explosion, which in this light curve is not appreciated, but the other important minima at 260 days, at 317 days and at 533 days. The explosion of Cadmium 109 is of such magnitude that another cascade of stable elements is created as radioactive, producing predominantly radioactive Cobalt 57 that decays in Iron 57 stable at 272 days after this explosion (red line at 735 days, 463+ 272 = 735 days), but since this light curve is under study, it was expected to reach the maximum brightness on December 15, 2017, as it has exactly happened. The radioactive decay of Cadmium 109 that occurs at 463 days (red line), the maximum increase in brightness occurs 13 days later (pink line), so there is a time delay in the emission of radiation in the Blazar. The absolute minimum brightness occurs at 385 days after the main explosion plus its delay time (discontinuous blue line). Other important minimums are 260 days, 317 days and 533 days. The few observations in those days and their high randomness prevents having defined it well. The explosion of Cadmium 109 is of such magnitude that another cascade of stable elements is created as radioactive, producing predominantly radioactive Cobalt 57 that decays in Iron 57 stable at 272 days after this explosion (red line at 735 days, 463+ 272 = 735 days). The absence of observation has prevented me from defining the maximum point, although it seems that this has happened. 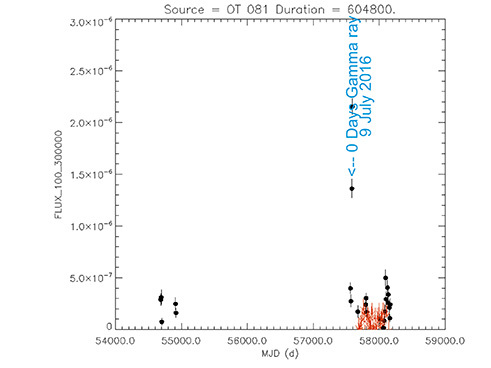 With regard to the explosion in Gamma rays occurred 6 days before the maximum brightness of the main explosion in the optical (very common in the Blazars), so this difference tells us that these two explosions in different wavelengths are not produced exactly in the same place. Even observing the two light curves in gamma rays it is observed that there are two explosions separated by 474 days, produced by the explosion of cadmium 109, confirming a time delay very similar to that in the optic. The radioactive decay of Cadmium 109 that occurs at 463 days (red line), the maximum increase in brightness occurs 44 days later (pink line), so there is a time delay in the emission of radiation in the Blazar . The explosion of Iodine 131 is observed, which occurs 8 days after the main explosion and the explosion of Californio 253, which occurs 18 days after the main explosion. These are a clear indication that a major explosion has occurred. The absolute minimum brightness occurs at 385 days after the main explosion plus its delay time (discontinuous blue line). Other important minimums are 260 days, 317 days and 533 days. The explosion of Cadmium 109 is of such magnitude that another cascade of stable elements is created as radioactive, producing predominantly radioactive Cobalt 57 that decays in Iron 57 stable at 272 days after this explosion (red line at 735 days, 463+ 272 = 735 days), but since the Blazar has an appreciable time delay, it actually occurs 70 days later (dashed yellow line), verifying its time delay in direct proportion. The radioactive decay of Cadmium 109 that occurs at 463 days (red line), the maximum increase in brightness occurs 68 days later (pink line), so there is a time delay in the emission of radiation in the Blazar. The absolute minimum brightness occurs at 385 days after the main explosion plus its delay time (discontinuous blue line). The explosion of Cadmium 109 is of such magnitude that another cascade of stable elements is created as radioactive, producing predominantly radioactive Cobalt 57 that decays in Iron 57 stable at 272 days after this explosion (red line at 735 days, 463+ 272 = 735 days), but since the Blazar has an appreciable time delay, it actually occurs 107 days later (dashed yellow line), verifying its time delay in direct proportion. The radioactive decay of Cadmium 109 that occurs at 463 days (red line), the maximum increase in brightness occurs 76 days later (pink line), so there is a time delay in the emission of radiation in the Blazar. The absolute minimum brightness occurs at 385 days after the main explosion plus its delay time (dashed blue line), as it is very clearly observed. Other important minimums are 260 days, 317 days and 533 days. The explosion of Cadmium 109 is of such magnitude that another cascade of stable elements is created as radioactive, producing predominantly radioactive Cobalt 57 that decays in Iron 57 stable at 272 days after this explosion (red line at 735 days, 463+ 272 = 735 days), but since the Blazar has an appreciable time delay, it actually occurs 121 days later (dashed yellow line), verifying its time delay in direct proportion. The radioactive decay of Cadmium 109 that occurs at 463 days (red line), the maximum increase in brightness occurs 7 days later (pink line), so there is a time delay in the emission of radiation in the Blazar. The absolute minimum brightness occurs at 385 days after the main explosion plus its delay time (dashed blue line), although it is not appreciated by absence of observation. Other important minimums are 260 days, 317 days and 533 days. The radioactive decay of Cadmium 109 that occurs at 463 days (red line), the maximum increase in brightness occurs 8 days later (pink line), so there is a large time delay in the emission of radiation in the Blazar. The radioactive decay of Rhodium 102, which occurs after 207 days, shows an appreciable time delay, thanks to the great detail of the light curve. I predicted that the explosion of Cadmium 109 would occur around January 25, 2018 with an error of about 5 days, depending exactly on its time delay. In the end, it happened exactly as I mentioned. As it has been an Explosion of Type III, an explosion occurs at 85 days as intense as in the main explosion, but its brightness increase is gradual and almost symmetrical. This is the main characteristic of Type III explosions. The minimum is also clearly observed at 60 days and at 103 days, unmistakable in this type of explosions. You can even see the explosion of Selenium 75 at 120 days. The explosion of Cadmium 109 is of such magnitude that another cascade of stable elements is created as radioactive, producing mostly radioactive Cobalt 57 that decays in Iron 57 stable at 272 days after this explosion (red line at 735 days, 463+ 272 = 735 days), but since this light curve is under study, it is expected to reach the maximum brightness on November 8, 2018 (discontinuous yellow line). With regard to the explosion in Gamma rays occurred 8 days before the maximum brightness of the main explosion in the optical (very common in the Blazars), so this difference tells us that these two explosions in different wavelengths are not produced exactly in the same place. The radioactive decay of Cadmium 109 that occurs at 463 days (red line), the maximum increase in brightness will occur about 20 days later (pink line). This will depend on the time delay that Blazar has, which I do not know. I estimate that it will occur around February 2, 2019, with an error of one week. The explosion of Iodine 131 is observed, which occurs 8 days after the main explosion. This is a clear indication that a major explosion has occurred. The explosion of Cadmium 109 is of such magnitude that another cascade of stable elements will be created as radioactive, producing mostly radioactive Cobalt 57 that decays in Iron 57 stable at 272 days after this explosion (red line at 735 days, 463+ 272 = 735 days), but since this light curve is under study, it is expected to reach the maximum brightness on November 9, 2019 (discontinuous yellow line). The radioactive decay of Cadmium 109 that occurs at 463 days (red line), the maximum increase in brightness will occur about 7 days later (pink line). This will depend on the time delay that Blazar has, which I do not know. I estimate that it will occur around June 28, 2018, with an error of three days. 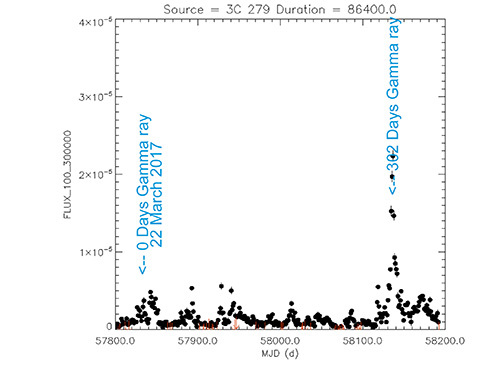 The absolute minimum brightness occurs at 385 days after the main explosion plus its delay time (discontinuous blue line), as it was very clearly observed around April 10, 2018. With respect to the explosion in Gamma rays occurred 1 day later than the maximum brightness in the main explosion, in the optical. There has also been a Gamma explosion 302 days later. I estimate that the next explosion will occur two days after the Cadmium 109 explosion plus its temporary delay, that is, around June 30, 2018. With respect to the second light curve, I have found another main explosion of Type I, It is noted that between 60 and 103 days there is no secondary explosion, confirming that they have been Type I. The absence of monitoring in this section of the curve, other secondary explosions are not appreciated. The difference between the two main explosions was 3,718 days (10 years). In the AAVSO database, I can not conclude that there is a previous repetition due to lack of observations. If it were repeated in the future, the next major explosion would occur around May 26, 2027. - The Blazars have a temporary delay. This indicates that the observed light is very close to the event horizon of the black hole. - They have a recognizable pattern. They are predictable. - Secondary explosions correspond to radioactive decays and are in direct proportion to the intensity emitted. By comparing the intensity of these secondary explosions, we can know their amount of heavy elements. - All AGNs have their maximum and minimum periods, equal. This confirms that all AGNs are the same objects, viewed from different perspectives. - Although the maximum brightness at different wavelengths is related, there is a time delay of a few days with respect to other types of wavelengths detected, so that light emission does not occur exactly in the same place. Even in the main explosion, the maximum brightness in Gamma rays usually happens about 3 days earlier than in the optic. - The higher the frequency detected, for example, in Gamma rays with respect to optics, the faster its brightness can change. This indicates that the gamma-ray emitting region is much smaller than in the optical region. - By comparing the degree of time delay with other astrophysical magnitudes, we could discover related concepts. - Depending on the Blazar, the main explosion as secondary explosions may be more acute or flattened, in the curves of light. We could know why the cone of the emitting Jet is narrower than others. I thank the AAVSO for permission to publish their light curves and the M1 Group for their important contribution. Also to all observers who have made these observations, without them, this work would not have been possible. To all of them, thank you very much. Also the NASA Fermi Group to authorize publish their light curves in gamma rays for a greater understanding of these objects.